Idk if i just had a bug, but i played a game against a priest who mind visioned Jeeves and played him, we both had empty hands and plenty of cards in our decks. 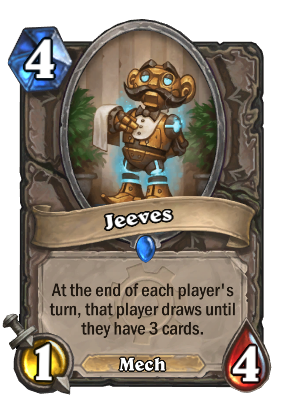 Problem is, Jeeves is supposed to give BOTH players 3 cards at the end of each turn, he only gave the priest draw 3 cards but not me... So I was left with an empty hand and he had 3 cards. I don't have any screenshots or videos to prove it. But it did happen and i lost the game because of it. So have anyone else got this bug? Why is it described 'until they have' instead of 'until he has'? "they" is both the third person of plural and the neutral third person of singular. If you want to talk about someone, but you don't know if that person is male, female or whatever, you can use "they" instead of "he/she". Also "they" is the preferred word for people that want to include non-binary people in the sentence. That guy won some games for my mech druid. Opponents often fail to eliminate this card, instead focussing on the damage dealers. So Jeeves draw me plenty cards. Having Jeeves be your last draw is probably the second funniest way to lose in this game, only after being killed by drawing your Flame Leviathan. incidentally it isn't an immediate death, if you play it with no cards in hand and an empty deck, you take 6 damage, from 1+2+3 attempted draws, so the death isn't instant. Makes sense, I came here to ask why Jeeves is played over Nourish in Egg Druid decks, but since Egg Druid relies on buffs, this makes sense now. He is a true gentle sir. Edit: The dream mill deck but sadly it would be too hard to pull off that dream situation where the opponent plays deathwing and you play this while hes 1-2 cards away from being fatigued. I applaud you sir; you are a true gentleman. Jeeve's + Mill deck will work wonders against someone running a Fel Reaver. This is my sleeper pick for the "Card of the Expansion" award. Many people are underestimating it. Aggro (especially Zoolock) is already terrifying and ubiquitous. Mark my words: Jeeves will put such decks over the edge. Warlock already has its hero ability card advantage, though it is conceivable that this might be a decent addition to rush decks like Shockadin and Backspace Rogue, which has faded since the release of Naxx. Well if you are playing aggro you probably don't want to play 1/4 minion for 4 mana with unlikely chances to be alive at start of your next turn. Also as aggro deck, you don't have many ways to protect it.